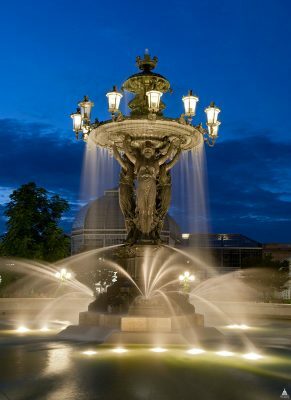 Frédéric Auguste Bartholdi’s “Fountain of Light and Water”; Image credit: Architect of the Capitol; public domain. It was in the 19th century that cast iron saw an explosion of popularity. Suddenly, it was not only found in America’s railroad and water systems, but also in the architecture. This cast iron boom began in 1849 when the Edgar Laing Stores were built in New York. The building meshed together brick with cast iron; it seemed to herald in the popularity of using cast iron to create memorable structures. Throughout the remainder of the nineteenth century and into the twentieth century, cast iron statues and fountains became increasingly popular. This was partly due to practicality; cast iron was known for being fire resist and, at a time before electricity was widespread, this was a major benefit. Apart from this sensible reason, cast iron could be easily poured into intricate molds, creating highly decorative structures. One of the most famous fountains in America is the Bartholdi Fountain, first unveiled in 1876. It is a formidable structure, measuring 27 feet tall and showcasing three sea nymphs with nautical images surrounding them. Made by Frederic Auguste Bartholdi, the creator of the Statue of Liberty, the fountain now resides in Washington DC. It has been restored multiple times, with the most recent and most significant restoration having occurred between 2008 and 2011. During this time, the fountain was moved from its site for a complete restoration and water treatment. Today, the structure is as awe-inspiring as ever, still standing tall in the Botanical Gardens of the nation’s capital. Well known structures like the Bartholdi Fountain are dwarfed in comparison to the largest cast iron statue in the world, the Vulcan statue, found in Birmingham, Alabama. It was originally shown at the 1904 World’s Fair in St. Louis to awed spectators, who were taken aback by the 120,000 pound structure. More amazingly, it was created in Birmingham of entirely local iron. To mark its 100 year anniversary, the Vulcan statue underwent a serious restoration costing $1 million in 1976. An observation deck was added and its tower was covered in marble, also from Alabama. This was only a small tweak compared to the $14 million restoration that would occur 25 years later. The entire statue was cleaned, repaired and stabilized to ensure that it didn’t crumble. It was then re-erected onto a steel pedestal, giving it an appearance similar to its original state over a century earlier. Less well known cast iron structures can be found scattered throughout the United States. One such structure is the Forsyth Park Fountain in Savannah, Georgia, first created in 1858 to be the centerpiece of the city’s Forsyth Park. It was an ornate structure, as most cast iron fountains are, depicting a Greek nautical theme like many of its contemporaries. Its creation was followed by continuous repairs until 1935, including the addition of a basin and an iron railing (to prevent onlookers from getting sprayed by the water) and the repeated repainting of the structure. Genuine steps toward preservation began in the 1960’s when the fountain was renovated for the first time and continued in 1977 when the cast iron figure in the center of the fountain was replaced entirely. When it comes to repairing and restoring cast iron statues and fountains, there are companies that specialize in the trade. Hiring professionals to work with the structure ensure its safety and historic preservation. Many reputable companies exist, such as ours, Antique Cast Iron, a company experienced in restoring and replicating major historic cast iron forms with a specialty in Vault Lights. Above anything else, it is recommended that you consult with a professional before making any attempts at restorations to ensure that the iron isn’t damaged. Most often today, it is the job of workers to restore rusted iron, structure failures, or missing pieces. As a preservation architect, we might do anything from minor cleaning and maintenance to a full repaint of the structure and replacement of certain parts. Since their rise in popularity in the mid-19th century, cast iron fountains and statues have preserved history and American culture. Today, they act as a window into the past and a clear representation of the intricacies of American art. If you have historic cast iron on your property that needs repair, please feel free to contact us. We are happy to help you.